Already open for months in Texas’s two most populated areas, real estate tech innovator Offerpad launched its home-selling and buying solutions in San Antonio and Austin on Monday, March 18. The company’s streamlined services will be facilitated by local employee real estate experts at its new San Antonio market office. From there, Offerpad will dedicate resources to serving home sellers and buyers in its two newest markets. San Antonio and Austin are Offerpad’s third and fourth Texas outposts, and second and third market launches of 2019. The tech-enabled real estate company opened Houston in January after beginning to serve Texans from its Dallas-Fort Worth office in November 2018. Now open in the state’s third and fourth largest metropolitan areas, Offerpad is available throughout the Texas Triangle, a megaregion that boasts a total population of more than 20 million. “High demand and great reception in our first two Texas efforts incited our expansion into the other major Texas metro areas. With such a promising real estate and economic climate in San Antonio and Austin, now is a great time for Offerpad to expand into Central and South Texas. We’re confident that we can provide real estate solutions that residents here will find very beneficial,” said Offerpad CEO, Brian Bair. Some positive factors that encouraged Offerpad to make the leap into San Antonio include the metro’s employment trends, income growth, and household growth. Generally, employment in the San Antonio market is increasing while unemployment is decreasing as jobs in hospitality, healthcare, manufacturing, and military continue to mount. Additionally, income is growing at its fastest rate in ten years and median household income has been on the rise since 2011. Families have also been maturing or moving into the area at increasing rates as household growth is up. It has risen from under 15,000 in 2010 to over 20,000 as of October 2018; the year-over-year growth percentage has climbed from 2 percent to 2.4 percent. 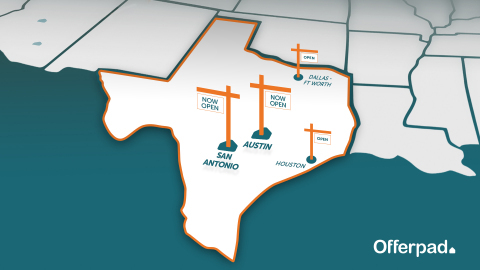 In broader terms, Offerpad is now available throughout the megaregion known as the Texas Triangle. It encompasses the state’s four largest metro areas: Houston, Dallas-Fort Worth, San Antonio, and Austin. Only claiming about 10 percent of the state’s geographical mass, it contains more than 70 percent of the state’s population, about three-quarters of its jobs and real personal income, and 80 percent of Texas’s gross state product. Offerpad’s presence in The Lone Star State’s most economically significant region, which is expected to continue to grow at increasing rates, is likely to present the real estate tech company with growing opportunity in each metro for those moving into and between the megaregion’s many cities, over 260 of which Offerpad now services. Having been recently presented with five Stevie Awards for the company’s customer service and sales effectiveness, Offerpad plans to employ its award-winning services in Texas to help residents have the most fluid and hassle-free home selling experience possible. Vice President of Customer Success, Jamie Nuss said, “We’re proud to serve a growing number of households all over Texas as we aim to make Offerpad the state’s number one choice for home selling and buying.” Additionally, last week, Offerpad announced a successful close of its Series C investment round. The newest debt and equity financing brings the company’s total funding to nearly $1 billion since the company’s start in 2015. To learn more about Offerpad’s solutions throughout Texas and across the country, visit Offerpad.com. Offerpad is revolutionizing the real estate industry by providing an innovative and convenient way to sell or buy a home. Founded in 2015, the leadership team brings decades of real estate experience that collectively has purchased, renovated, and rented or sold more than 100,000 homes. Offerpad is a privately-held company, headquartered in Arizona, with markets in Atlanta, Austin, Charlotte, Dallas-Fort Worth, Houston, Las Vegas, Los Angeles, Orlando, Phoenix, Raleigh, Salt Lake City, San Antonio, Tampa and Tucson.